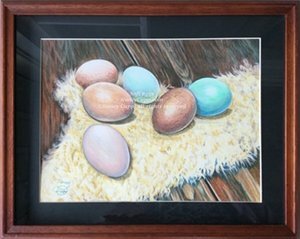 Around Easter time, we started getting farm fresh eggs from a friend at church who had some Araucana hens and a few other chicken breeds. 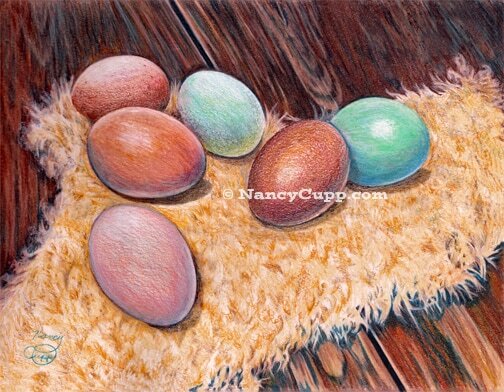 I was delighted to get natural, colorful eggs of various sizes and colors. The problem was that I hated to break the shells of the aqua eggs because they were so pretty. I saved some of the eggs and decided to do a drawing of them. My sister raises sheep and gave me some wool skins, so I laid the eggs on the wool and later named it Soft Eggs because of the soft wool bed they are on. The color of the eggs are it's natural color for that breed. ​I didn’t really expect to find very many scriptures on chickens in the Bible, but, this is what I “gathered”.